This summer I went to the United Kingdom (UK) and after taking care of the usual traveler’s stuff my next thought was: How much does it cost dental care in the UK? 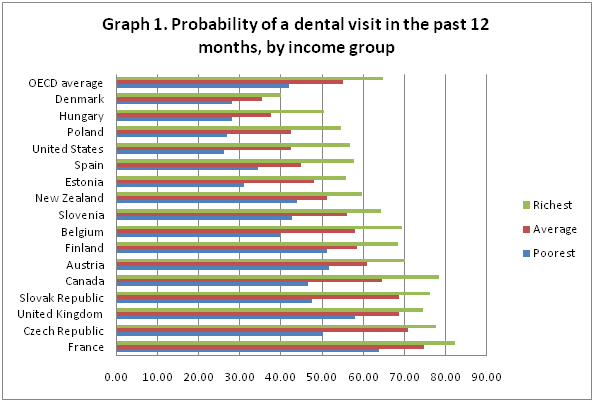 As shown, there seem to be no significant difference in access to dental care across income groups in the UK when compared to this particular OECD average. 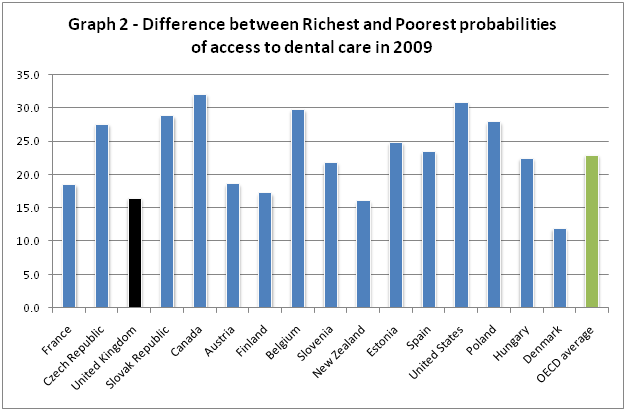 For a better analysis, I computed the difference between the probabilities of access to dental care of “richest” and “poorest”, shown in graph 2. The results confirm that the demand for dental care in the UK in 2009 was not so income sensitive as in the average of OECD, seeming relatively equitable. 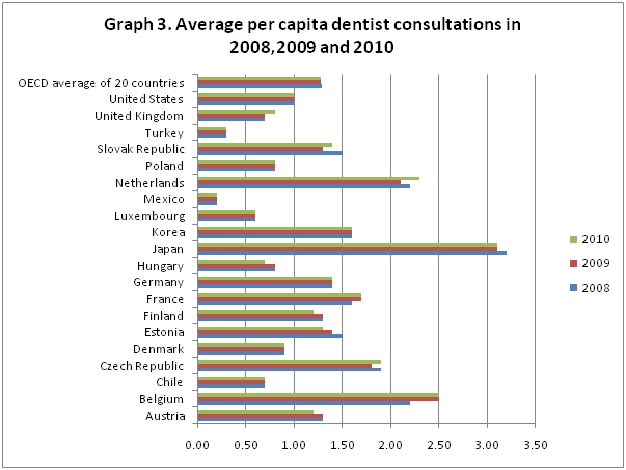 Basically, the average number of per capita dentist consultations in the UK was always below 1, below the recommended by dentist’s associations and the OECD average! Two lessons may be taken from this analysis. Firstly, never travel to the UK without doing a dental check-up first – high prices await. Secondly, the demand for dental care in the UK seems not to be income sensitive, although the quantity demanded of dental care demanded is likely to be price sensitive. I believe it’s time for the NHS to provide insurance for dental care, before British’s bad teeth become the new national disease. Categories: Dental care, Health Economics | Tags: Access to dental care in the UK, Income sensitivity of the UK dental care demand, Price sensitivity of the UK dental care demand, Prices of dentists in the UK, UK dental care system, United Kingdom | Permalink.